After the frost thaws and the coffee kicks in, it’s a trek through dripping forest until you reach the tree line. Stay dry and warm in Patagonia's Down Snap-T® Pullover, and keep a sharp eye out for the weathered arrow to the summit ridge. 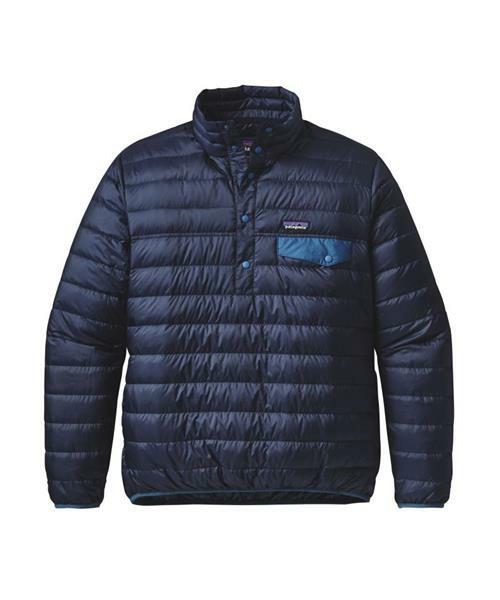 The jacket is insulated with 600-fill-power 100% recycled down reclaimed from used down products, while the featherweight, wind- and water-resistant 100% recycled polyester ripstop shell and lining fabrics are treated with a DWR (durable water repellent) finish to slough off light moisture. Classic Snap-T styling includes a 5-button snap placket, stand-up collar and left-chest snap-closure pocket; elasticized binding at the cuffs and hem helps seal out wind and weather. Two handwarmer pockets; climb-rope hanger loop at inside back collar.